as at the Heritage Centre on the other side of the Green. 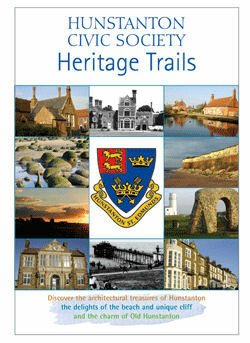 This leaflet was produced and published in 2005 by HCS to enable residents and visitors to understand and appreciate the history of Hunstanton. A copy was given to every household and schoolchild in Hunstanton. Copies may be bought for 50p each Funded by the Heritage Lottery Fund, the Nationwide Building Society and the Countryside Agency. In 2007 the HCS placed the Hunstanton Heritage Plaques on a selection of buildings and sites of interest in Hunstanton and Old Hunstanton – to celebrate the history of the town and village. The leaflet shows visitors and residents alike where the plaques are sited.